I think Tom Kevill Davies (aka ‘The Hungry Cyclist’) has the right idea – bikes and food are a perfect combination for an exciting adventure. Over the last few months I have joked with locals that my days are spent eating and cycling, explaining my platefuls of food and armfuls of groceries with my bicycle mime as fuel for my miles. And for the most part that’s what eating has been – fuel and fuel only, an expedition in itself. Sometimes it has been hard to stack in the calories because shops and cafes have been hard to come by, or because choice has been absent; and at others my daily feeding quests have been a rather monotonous and repetitive march of processed, packaged foods. It’s all about eating whatever you can whenever you can because at times you don’t know were your next meal is coming from. 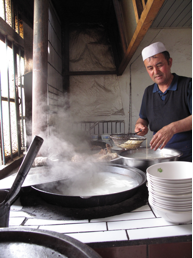 China is like this in some respects – in that towns and fuel stations are sometimes miles apart, but I am eating more delicious and novel foods here than I have done in any other country so far. This is one of the reasons I love China – they really know how to do good food. It is a menu designed for the long distance cyclist, with carbohydrate, fat and flavours aplenty. Happily too, good eating comes relatively cheaply, so I can often feed and re-feed on hearty, wholesome, freshly prepared food at cafés for just a few pounds a day. After the mostly fruitless weeks crossing Kazakhstan I am loving the fresh fruit of China’s Zhinjang region – market stalls are full of watermelons, apricots and peaches so juicy they dribble down your chin, bright orange mangos, weirdly-shaped fruits I have never seen before and the juiciest, sweetest little grapes I have ever tasted. Yum and yum and yum. I am making the most of it while it lasts, knowing that far Eastern Russia will be sparse at the best of times and the oceans ahead will be completely void of fresh stuff after a fortnight or so. But the fruit is just a tiny part of the culinary adventure and I am enjoying trying all kinds of new foods and bits of animals that would never make it to the dinner table at home. I haven’t yet plumped for the ‘Thousand Year Eggs’ or pig’s nose, but I have tried all sorts of dumplings and patties and pancakes fried up with various ‘unknowns’ at local markets and yesterday evening I ate a duck’s brain. Thankfully for both of us the duck was already chopped up and plated out Peking style, but I still had to scoop the brain from the head, recently lopped off the golden body in front of me. That’s another thing I like about China – nothing goes to waste here. Top to toe, inside and out, animals are eaten and valued as nourishing food. 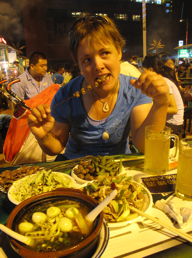 That said, having eaten my way through a variety of sheep’s innards the other day, skewered up over a barbecue at Urumqi’s night market, I am happy not to have to eat certain internal organs to survive. 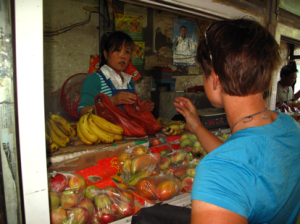 I had been taken to the night market by a lovely local woman, keen for me to sample some local fare. After so long in the middle of nowhere all by myself I was a bit dazed by the buzz of so many people both eating and cooking and had no idea what I should choose to eat. Yang chose for us, therefore, and very soon our little table was full of dishes. The peanuts and peas were about the only thing I recognised so Yang explained them, translating on her phone. We got to the mutton tray, and she told me it was one of the most traditional and, it turned out, entirely for me as she doesn’t eat meat. I spotted a single skewer of meat as I knew it in the pile and the rest was new to me. As I chewed my way through the one of the little pieces of white tube on one skewer Yang showed me the translation on her phone. I stopped chewing as I read the word ‘intestine’ and swallowed as quickly as I could. Texture and translation aside, it was rather tasty – or at least the herbs and spices and charcoal twang were good. The same can be said for the stomach, too and I surprised myself at enjoying the liver and kidney – never before have I been able to say that about these organs, of any animal. I think I have just been too wimpy before; afraid of an unknown texture, biased by the thought of it rather than equating it with valuable sustenance. It is a mindset I am trying to leave behind. Next was the deep bowl of soup, full of odd mushrooms that looked like soggy worms, tiny quail’s eggs and a tangle of greens at the bottom – seaweed I think. Equally tangly was another bowl, home to four different strands of noodle of varying thickness, flavoured with more spices and floating in a little broth. Washed down with two jugs of ‘Cawas’, a sweet Russian drink that has made it across the border to become a local favourite, it was a very tasty evening indeed and definitely blew my ‘pasta, tomato, cheese’ camping staple into touch. Suffice to say my chopstick skills are improving with each meal – today I mastered the peanut pick-up and I have just about honed my ‘noodle slurp’, too, which feels much more fun than the polite way I was taught to eat noodles as a child. So, here’s to taking a leaf out of China’s recipe book – fresh is best, slurp your noodles, share your food and don’t waste a thing. PPS Above photos taken before I took my penknife to the mop and gave it a trim. Who needs hairdressers when you have a penknife? A penknife to your hair?????? Amy ( at the hairdressers) asked me the other day how you were looking after your hair whilst you were away…..I can’t tell her now , as she is off to Italy next week…..to go to college there and work there for a year or two. She would be horrified to see you with a knife at your hair. Following your adventures, Sarah. You have made such incredible progress across Eurasia. But this blog really grossed me out–I’m vegan! Please stop being so open minded and do not eat intestines again!! I mean, seriously! I also follow Roz Savage’s blog. You Brits–must be something in the water… That’s how I found you, per her good word. She’s been stuck in an eddy for 5 days, but otherwise is in good spirits. We of course don’t know where she is because she’s blocked her GPS transmits for fear of pirate attacks. Anyhow, keep on going, Sarah. You are amazing! Exciting review of edibles in China. All part of dealing with a culture through food and drink. I have experienced many things in Yunnan, and in Xianggrilila at the market stand they let me bbq my own stick of yak meat. Well done on tackling the intestines, kidneys and livers are also tasty, I also strongly recommend Lamb’s hearts (which you can get from you Butcher when you get back to the UK) they are so tasty. Sarah, Am just loving all your blogs – you amazing Lady!!! Keep it up girl, and maybe you should think about writing a cookery book when you eventually return to Blighty!!! I spent a bit of time in Hong Kong and totally enjoyed the food so I can understand just how much you are enjoying your culinary adventure.